Been awhile since I've done a photoblog, but by golly today's as good a day as any. While I wait for Flickr to upload my photos, I'll start writing about my weekend. I think I left off with Mr. Diva stalking me and making me come home from a fabulous GNO. Yeah. So Saturday morning I woke up later than I had intended because Mom had the kids and she was wanting to hit some flea markets and garage sales and I knew she'd be whizzed. So I hit the floor, threw on some shorts, a bra, a 'do rag, grabbed a Diet Coke and ran out the door. Sure enough, she was whizzed. But she got over it quick and offered to feed us all lunch. We totally said yes. So after lunch the conversation turned to Branson and how we'd like to go and take the kids to see Joseph and the Amazing Technicolor Dreamcoat. I really didn't have the money, but thanks to the First National Bank of Mom, the Diva family was all set. I called Mr. Diva at work and told him the plans and then went home to pack. 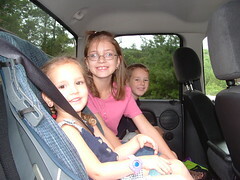 Mom and Sis went down before we did so that they could get a motel room since Mr. Diva had to work till 4. The drive down Mr. Diva and I played duelling air conditioner, but other than that it was pretty uneventful. We encountered a car show on The Strip and came in on the back routes, which is always better anyway, finally found the motel, got settled and Mr. Diva went promptly to sleep. So much for family time. The kids and I went to the pool and they swam for a couple of hours with Sis, aka YaYa, while I stood at the side and counted to five over and over and over again to make sure no one was drowning without my knowledge. Sunday morning we got around and after a delightful breakfast in the motel where my 3-year-old spilled her coffee all down her white shirt and everyone said, "Oh Diva, of course you can eat breakfast in your pajamas, no one will even notice!" except I was the ONLY fool in my pajamas looking like I just rolled out of bed (I had) and felt like a total dork. We did a little shopping and then went to the theatre. 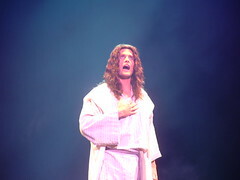 We had kept it a secret from the kids and when we pulled in Abby just drew in this huge breath and whispered, "Joseph!" 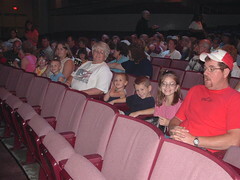 This is the crew waiting excitedly for the show to begin. You can see how excited Mr. Diva was. They make a big production about not taking flash pictures during the show because it messed up the lighting for the audience and it also distracts the cast. 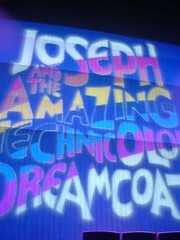 So what did I do during Joseph's first song, but flash a big ol' picture right in his face! We were on the first row. I'm sure he was seeing spots during the next two scenes. I was mortified. Mom said she just knew someone was going to come down and throw me out. But it was worth risking the theater po po's coming to get me because look how it turned out! Without the flash, the pictures turn out like this - just a bit blurry. 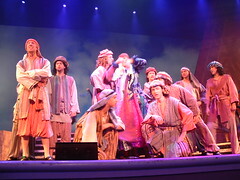 This picture is of the brothers singing about how much they loathe Joseph and his coat. It rocked sitting where we sat. I got some awesome pics. 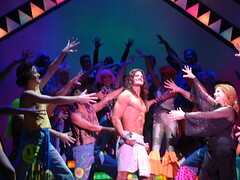 This is from my favorite scene, "Go Go Go Joseph". Complete with well, go-go dancers. Kady is pretty shy when it comes to total strangers, so when she walked right up to this "brother" (who also played Pharoah) we were astonished. Then she got embarrassed and hid her face behind Mom's legs. 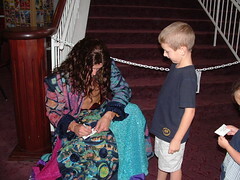 The kids all wanted Joseph sign their ticket stubs. 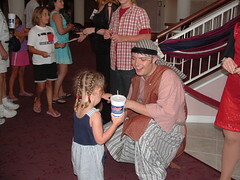 This is Sam with Landon, aka Joseph. 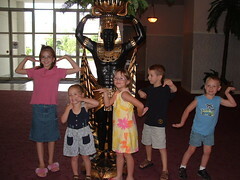 This last one is all five kids posing with an Egyptian sculpture in the lobby. Notice they are all doing some kind of Egyptian pose, except for Kady who just opted for a traditional make a face sticking your tongue out pose. You really should check out the show. And if you take the whole fam damily, get the Family Pack. I thought you would have at least brought Joseph back with you. We could have taken him to the Elks!!! Or molested him in the parking lot, what ever you think is best. Abby asked me last night if Joseph could come live with us. I told her that his wife might get kind of lonely. She shrugged and said, "Eh. I guess she could come, too." If he comes to live with you, we are getting rid of the cute one in braids, I get her bed. The kids will be fine out in the playhouse, the coyotes will take care of them for us.